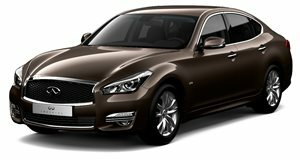 The Infiniti Q70 is a midsize luxury sedan that offers a high level of luxury and comfort although it has been on sale for some years now and available technology features are lagging behind its competitors. Some minor changes to the available options are the only changes for 2017. The Infiniti’s interior offers a classy mix of high quality materials and surfaces. The comfortable seating can accommodate taller adults both in the front and in the rear and the wide center console and curvy dashboard feel well-made and the design has aged well. The available long wheelbase models add to the rear space and make for one of the most spacious cars in its segment. What has suffered badly is the infotainment system which lags behind all of the Q70’s competitors and lets the otherwise quality interior experience down. The trunk space too is not quite up to expectations, a narrow load space, rear seats that do not fold down and smaller than average cargo area make it less practical for load lugging duties. The Q70 may not have the outright sportiness of some of the latest European competition but it has good steering feel and tackles challenging roads with enthusiasm. Brakes and acceleration are both strong and the transmission shifts through the gears unobtrusively when driven sedately, rising to the challenge when quick acceleration is called upon.The ride is good but can feel a bit firm over some road surfaces, in general though the Q70 provides unruffled progress both in the city and on longer trips. The Infiniti Q70 is available with either a 3.7-liter V6 which produces 330 horsepower and 270 lb-ft of torque or a 5.6-liter V8 which offers 420 hp and 417 lb-ft. A hybrid model uses a 3.5-liter V6 which produces a combined 360 hp. All are equipped with a 7-speed automatic transmission. Rear-wheel drive is standard with all-wheel drive optional on the 3.7-liter and 5.6-liter models. The Q70 offers strong performance across the range and while fuel economy is not a strong suit on the standard gas-powered engines, the hybrid model offers a very commendable 29/34 mpg rating in city/highway driving. The V8 is not much less efficient than the smaller 3.7-liter V6 and if serious in-gear acceleration is a priority it is a good choice. The Q70 3.7 offers leather covered seats with heating and power in the front, dual zone climate control, rearview monitor, 7-inch color display, cruise control and a complementary Premium Package that adds navigation, front and rear park assist, leather seats, Bose 10-speaker audio system and Infiniti connection telematics. The Q70 5.6 includes all of the above and adds the V8 engine and a surround view monitor. Both models are available with all-wheel drive and in a long wheelbase Q70L form. The Q70 Hybrid is also available with the complementary Premium Package and adds pedestrian detection and power heated front seats. It is not available in all-wheel drive or long wheelbase forms. Depending on the trim level selected a Technology Package including driver safety devices such as forward collision and blind spot warning is available as is a Sport Package which includes 20-inch wheels, sport brakes and front sport seats. The Infiniti Q70 counters its aging technology and lack of standard safety systems with a luxurious interior, sporty handling and characterful engine choices. A hybrid model offers some relief at the gas station. In the very competitive midsize luxury sedan segment, the Q70 will remain a heart over head choice until it receives a more comprehensive technology update to bring it in line with more modern competitors.